Looking for a Fantastic Prague Accommodation? On Popes Creek in Westmoreland County, park rangers tell visitors that “George Washington slept here first.” It’s a riff on that old line encountered at innumerable Mid-Atlantic historic sites, but if any place has bragging rights, it’s here—George Washington Birthplace National Monument in Virginia’s Northern Neck. Here on this acreage, the first U.S. president came into the world. A STONE Age ‘cult’ henge site and human remains – which could belong to some of south Warwickshire’s earliest residents – have been discovered close to Stratford. Archaeologists have found the 4,000 year-old remains at a new housing development in Newbold-on-Stour, on fields at Mansell Farm. Experts say it is an ‘important discovery’. A medieval brewery has been discovered by archaeologists along the route of Lincoln Eastern Bypass. Egyptian authorities say they caught looters digging up an ancient stone block carved with an image of a pharaoh. In the city of Abydos, antiquities authorities say they were inspecting an old two-story, mud-brick house when they found that the owner had excavated a hole in the floor. Archaeologists often spend years digging and hoping they'll find the remnants of ancient civilizations. There's a lot of ground yet to be uncovered. Archaeologist Sarah Parcak says less than 10 percent of the Earth's surface has been explored, so she's leading the way to speed up the search. Parcak uses satellite photos to locate ancient sites and she's finding them -- thousands. It's called space archaeology and it's transforming the field. Sarah Parcak is a professor at The University of Alabama at Birmingham. We met her in Egypt doing what she loves most: digging in the dirt. A team of evangelical Christian explorers found what they claim is “99.9 per cent” certainly evidence of Noah’s Ark beneath snow and volcanic debris on Mount Ararat in Turkey. Noah's Ark Ministries International, a Hong Kong-based documentary team, claim to have found wooden pieces from a structure which carbon dates back 4,800 years and was found around 13,000 feet above sea level. ARCHAEOLOGY NEWS (August 2, 2016)– Ancient Digger brings you the latest archaeology news and headlines everyday of the week! Ancient hearths and some 1,300 artifacts, including unglazed ceramics and pieces of soapstone, have been found at an industrial construction site along the South Camden waterfront. The Local, Italy, reports that cooking equipment, such as metal grills, pots, pans, and earthenware crocks, have been returned to the kitchen in the Fullonica di Stephanus, a three-story launderette where the garments of wealthy Romans were washed some 2,000 years ago. The equipment was discovered in the launderette in 1912, but had been moved to other areas of Pompeii over the years. The grills were placed over troughs where charcoal fires were lit. Meat, fish, and vegetables were then placed on the grills. Soups and stews were cooked in pots and pans on tripods placed in the coals. “We’re delighted the pieces have finally been put back on display where they were found,” said Massimo Osanna, archaeological superintendent of Pompeii. 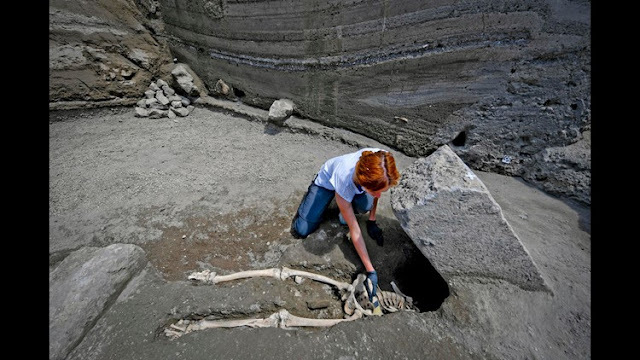 For more on Pompeii, go to "Family History." The mysterious origins of the British archaeological site most often associated with the legend of King Arthur have just become even more mysterious. Archaeologists have discovered the impressive remains of a probable Dark Age royal palace at Tintagel in Cornwall. It is likely that the one-metre thick walls being unearthed are those of the main residence of the 6th century rulers of an ancient south-west British kingdom, known as Dumnonia. Excavations on the grounds of an eighteenth-century country house known as Hillsborough Castle have uncovered a skeleton thought to have belonged to a young woman who lived 1,000 years ago. Acting on the recommendations of the Archaeology Department of Uttar Pradesh, district authorities have directed police to demolish an illegal structure being constructed by a man close to the heritage memorial of the Bharatpur dynasty. AN EXCAVATION at Fulford, which precedes the 950th anniversary of the 1066 battle, is turning into the "best imaginable" dig, says archaeologist Chas Jones. He said the dig on the Germany Beck site had led to further finds of tools which were he believed to have been used by medieval armourers to repair dents in helmets and shield-bosses. 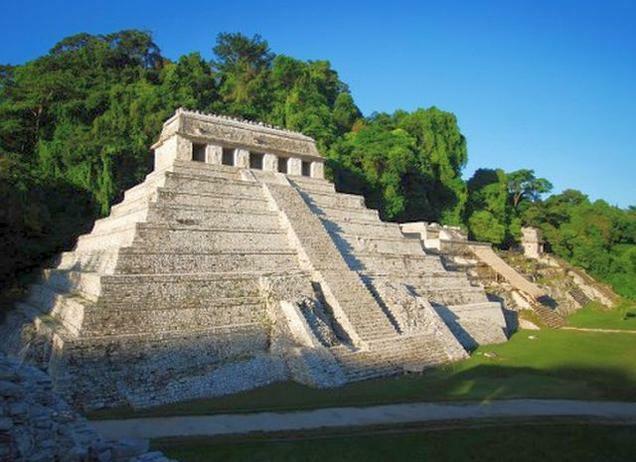 Archaeologists at the Mayan ruin site of Palenque said on Monday they have discovered an underground water tunnel built under the Temple of Inscriptions, which houses the tomb of an ancient ruler named Pakal. Archaeologist Arnoldo Gonzalez said researchers believe the tomb and pyramid were purposely built atop a spring between AD 683 and 702. The tunnel led water from under the funeral chamber out into the broad esplanade in front of the temple, thus giving Pakal’s spirit a path to the underworld. Morning Ancient Diggers. I was contacted about a wonderful opportunity for those of you interested in digs pertaining to prehistory. The archaeological fieldschool in Jersey, Channel Islands is located at Les Varines, a Magdalenian settlement site approximately 15,000 years old. To date, the site has yielded over 5,000 stone artefacts, preserved animal bone, paved areas and, most exceptionally, engraved stones which have recently gained international media coverage and was featured in BBC2’s Digging for Britain. This year the field school is available to students from external universities. They have five placements available for the 2016 season, and the deadline is right around the corner, May 25th. Accommodation is camping but there are modern, clean, indoor WC/showering facilities, dining and socialising spaces. Meals are catered for by their project cook and pick up/ delivery to the airport is included. The total fee is $1,450* (excluding travel costs) covering two weeks of time. Dr Matt Pope (UCL Institute of Archaeology) email: m.pope@ucl.ac.uk. In your email please specify whether you are interested in Field Season 1 (July 10 – July 23) or Field Season 2 (July 24th – August 6th) or whether you are able to do both. The application deadline is June 25, 2016).